1984 Chris-Craft Aquahome 1984 Chris-Craft AquaHome, Beautiful 46' houseboat with all the amenities! This houseboat is ready to live on or just enjoy a weekend get-away! It comes with a full kitchen including refrigerator/sink/range/microwave/toaster over. The salon is open and spacious with windows all around. There are new wood-grain vinyl floors throughout the boat. The master bedroom has a queen bed with lots of floor space, a big closet, windows, and a skylight hatch with steps that open up to the 3-level back deck. The second bedroom is under the salon and has 2 twin beds. There is a washer and drier onboard, which has been SO convenient. The front and back air conditioners also double as heaters in the winter. It has 1.5 baths. The master bath has a large bathtub/shower separated from the toilet and sink space. The half-bath has a sink and toilet. There is a stereo system with speakers wired to each room in the boat as well as the outside deck.I have been living on this boat for the past 3 years and renting it out as a vacation rental during the summers. It's a wonderful, extremely comfortable living space that you will love! Specifications: Single fiberglass hull. Two 260 Mercruiser engines with V-drive system. Two 120-gallon fuel tanks. 80-gallon freshwater tank. Two holding tanks, totaling 35 gallons. Two CruiseAir air conditioners/heaters. Engine controls and steering from the fly bridge or inside the cabin. Two 50a/125v shorepower receptacles and two 50' power cables included. DC and AC systems, with full circuit breaker panel to control electrical systems. Pressure-regulated fresh water hookup. 10-gallon water heater.If you would like to know anything else, please feel free to contact me. 1984 Chris-Craft AQUAHOME, Aft master bedroom. Master bath with shower and tub. Two hot water heaters. Cuddy bedroom in bow with twin beds. Salon with kitchen area. Contains. surround sound, flat-screen TV with DVD player. Convected oven with microwave, stove, and double sink. Granite counter tops throughout. Split controls with flying bridge. Separate stereo from flying bridge. Plenty of room on all three decks. Rebuilt Onan generator. 6.5kw in good condition.$56,000.00. 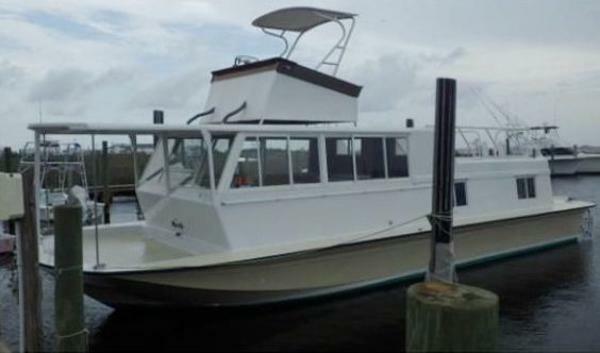 1984 Chris-Craft AquaHome, Beautiful 46' houseboat with all the amenities! 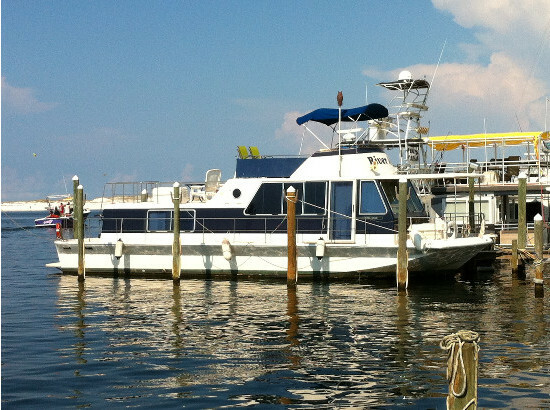 This houseboat is ready to live on or just enjoy a weekend get-away! It comes with a full kitchen including refrigerator/sink/range/microwave/toaster over. The salon is open and spacious with windows all around. There are new wood-grain vinyl floors throughout the boat. The master bedroom has a queen bed with lots of floor space, a big closet, windows, and a skylight hatch with steps that open up to the 3-level back deck. The second bedroom is under the salon and has 2 twin beds. There is a washer and drier onboard, which has been SO convenient. The front and back air conditioners also double as heaters in the winter. It has 1.5 baths. The master bath has a large bathtub/shower separated from the toilet and sink space. The half-bath has a sink and toilet. There is a stereo system with speakers wired to each room in the boat as well as the outside deck.I have been living on this boat for the past 3 years and renting it out as a vacation rental during the summers. It's a wonderful, extremely comfortable living space that you will love!Specifications: Single fiberglass hull. Two 260 Mercruiser engines with V-drive system. Two 120-gallon fuel tanks. 80-gallon freshwater tank. Two holding tanks, totaling 35 gallons. Two CruiseAir air conditioners/heaters. Engine controls and steering from the fly bridge or inside the cabin. Two 50a/125v shorepower receptacles and two 50' power cables included. DC and AC systems, with full circuit breaker panel to control electrical systems. Pressure-regulated fresh water hookup. 10-gallon water heater.If you would like to know anything else, please feel free to contact me. 1970 Chris-Craft Aquahome (LOCATION: Wanchese NC) The 47 Aquahome by Chris-Craft is a houseboat designed for weekend getaways with room to live aboard. She comes with tons of deck space and a spacious two stateroom interior. There’s space for everyone and everything.On deck we have two levels of decks beginning on top with a covered bridge with open sun deck. There is ample room to relax, entertain, or sunbathe. The walkaround main deck has room forward for casual seating with room for fishing. Wide side decks allow for easy movement. The aft deck serves as a swim platform or casual seating area.The recently renovated interior features open floor plan, large windows, and beautiful 2000 year old cypress wood throughout. 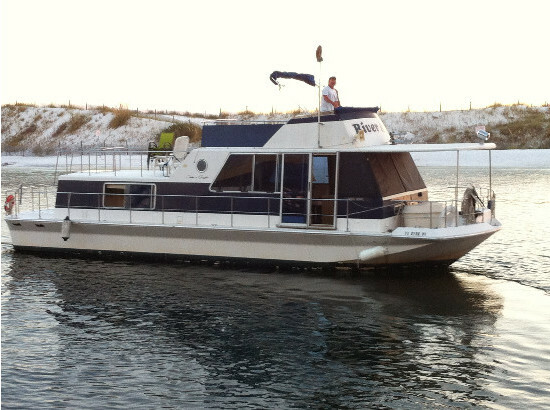 There is an L-shape lounge with table forward, a full galley port side, and a dinette to starboard.Power is provided by the very desirable 225 Honda four stroke engines for long-lasting, dependable, and economical performance. Mechanical features include a Northern Lights 5.5-kW diesel generator. 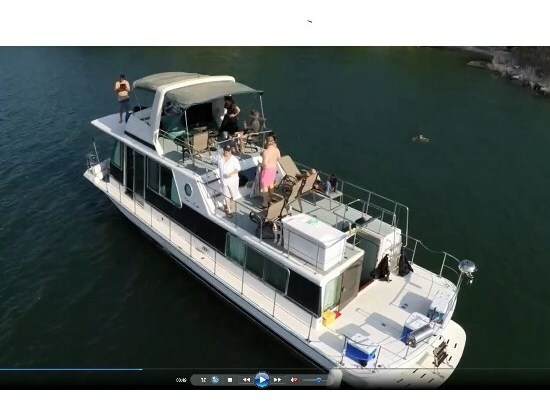 This Aquahome is a full featured houseboat with room to spare, is well equipped, has been professionally maintained, and is ready to take you away to weekend or vacation adventures. A complete survey is available. Call now for more information and to schedule a showing.